With providers such as CyberGhost offering new streaming-specific features and old favorites such as TorGuard dropping the ball, it’s time that we updated our best VPN for Netflix guide. It should come as no surprise that our best VPN picks work well with Netflix, but newcomers have a shot at the limelight, too. In this guide to the best VPN for Netflix, we’re going to give you our top five picks for streaming anywhere in the world. Before getting to our choices and why we made them, though, we’re going to go over why you need a VPN for Netflix and the criteria we used to make our selections. If you’d rather avoid reading a few thousand words, you can save yourself the hassle and sign up with ExpressVPN. In addition to being the best VPN for Netflix, it’s the best virtual private network for almost everything else. Though the price is steep, it does everything we want a VPN to do. We also made a video recap of this article. If you’re a VPN newbie, read our what is a VPN guide to get up to speed. In addition to providing privacy when using the internet, VPNs have other practical use cases, including torrenting and streaming. Those who live in a country that already offers Netflix may not see a use for a VPN, but there is one. Netflix, along with most other streaming platforms, has what’s known as distribution geoblocks. In short, the content on the platform is only available in a particular region based on what the distributor wants. Take Better Call Saul as an example. The fourth season of the show aired on AMC in the U.S., with plans to move it to Netflix once the full season went to live television. AMC has a deal with Netflix in other parts of the world, though, where episodes are streamed through the platform instead of going to live television. With a VPN, you can appear as if you’re in any part of the world, so if you want to watch Better Call Saul from the U.S., you just need to connect to a server located in the UK. That’s just one example. Netflix has many other titles that are exclusive to certain regions. That’s assuming you can even access Netflix. For some, a VPN not only opens the possibility to watch region-locked content, but to watch content at all. VPNs are good at bypassing censorship, meaning those living under oppressive circumstances can still lighten the mood with a little binging. If you’re looking to beat the Netflix VPN ban, there’s only one question that needs to be answered: does the VPN access Netflix? That was the minimum VPNs needed to be considered, and you’d be surprised how many providers can’t meet it. With that basic criterion, our list of 40 or so VPN reviews shrank to a fraction of the total. Getting into Netflix once isn’t enough, though. We further whittled the selection to providers that could access Netflix consistently. Some VPNs may access Netflix on certain servers — read our TorGuard review for an example — while others are blocked entirely. Our selections not only access Netflix, but do so across almost every server in their networks. There are technical considerations for streaming, too, including what transport protocol you’re using and what port you tunnel through with OpenVPN. 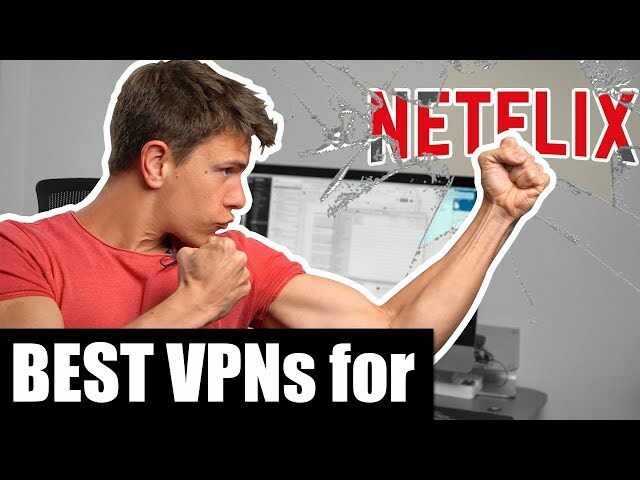 For those who don’t know the first thing about VPN security or VPN protocols, knowing how to configure a VPN to access Netflix can be a hassle. Because of that, we focused our search on providers that are preconfigured to give you the best chance of breaking into Netflix or come with streaming specific servers. In some cases, such as with CyberGhost, specialty servers will access a variety of platforms, including Netflix. Access is only a piece of the puzzle, though. Once you break into Netflix, you’ll have to contend with speed. Because Netflix is capable of streaming in 4K, it’s important to choose the provider that takes the least of your bandwidth. As with any roundup we do, we also considered aspects such as price, user-friendliness and server locations, but those were peripheral concerns. Our focus for this roundup is that a provider can access Netflix consistently and quickly. When it comes to streaming, ExpressVPN is in a league of its own. It can break the barriers of Netflix, Hulu, Amazon Prime Video and BBC iPlayer. In addition to being our best VPN for Netflix, it took the crown in our best VPN for streaming and best VPN for BBC iPlayer guides. ExpressVPN exemplifies consistency, and that’s why it’s such a great choice for Netflix. During our testing, every server accessed Netflix quickly, no matter where we were located or what region of Netflix we were trying to access. Plus, the stream was fast. ExpressVPN is the fastest VPN provider we’ve tested by a significant margin. Though some providers may be faster in particular locations, ExpressVPN’s consistency across its network is unmatched. You can blindly pick a server and still get great speed, assuming it’s in a country that offers Netflix. As for the other aspects of the service, ExpressVPN is excellent. It scratches every VPN itch with an intuitive interface, quick speeds and top-notch security. That said, it’s not the only provider that does so. As we said, ExpressVPN isn’t our top pick because it does everything we want. It’s our top pick because it does everything we want consistently. You can see that when you first start the application. No matter where you’re installing it, ExpressVPN provides the same no-nonsense method for making your first connection. It even made first place in our best VPN for iPhone and best VPN for Android guides for its adaptable approach. ExpressVPN is the de facto choice for Netflix and almost everything else. Though it doesn’t have the bells and whistles of some providers, it has a resilience none can contend with. You can learn more in our ExpressVPN review or try it with a 30-day money-back guarantee. CyberGhost has been a solid choice for Netflix for a while, but the update to version 7 has pushed it even further ahead. With a revamped interface designed to show its features off, CyberGhost has made it easier than ever to stream Netflix, all while keeping you secure. Instead of making you pick a server and go for it, CyberGhost provides a selection of specialty streaming servers. Each is optimized for a different platform, making it simple to figure out which you should choose. The basics are accounted for, including Netflix, Hulu and BBC iPlayer, but CyberGhost has rare offerings, too. There are around 50 optimized servers optimized for different platforms. From Crunchyroll to Channel 4, CyberGhost has a server for almost everything. Thankfully, they all work. During our testing, CyberGhost was able to access every platform it said it could quickly. Though it was always feature-rich, CyberGhost’s update added even more. In addition to the streaming servers, there’s a set of torrenting servers optimized for data-hungry peer-to-peer connections. That feature, along with CyberGhost’s excellent security, earned it a spot in our best VPN for torrenting guide. The speed isn’t as fast as ExpressVPN’s, but it is as consistent. During our testing, CyberGhost had a larger initial drop, but stayed resilient no matter where we were tunneling. Plus, the latency stayed low, which is why CyberGhost took third place in our best VPN for gaming guide. Outside of the solid service, the features and low price point are what sets CyberGhost apart. It’s the best bang for your buck on the market. You can learn more in our CyberGhost review or try it yourself with a generous 45-day money-back guarantee. NordVPN is the antithesis of ExpressVPN. Though both are solid providers, NordVPN lives by the seat of its pants. It has a higher top speed but less consistency, and it comes with a larger server network. All of that combines to make it one of the best providers. It just requires digging to find the gold. It earned a perfect score in streaming performance the last time we reviewed it. Even when servers were giving us a hassle, it was able to access Netflix, BBC iPlayer, Amazon Prime Video and Hulu. Once we found a server with decent speeds, the experience was incredible. If it wasn’t for NordVPN’s inconsistency, it would take first place in this guide. Once you find a server that works, NordVPN is fast and resilient. As long as you have a fast unsecured connection, NordVPN can stream in 4K. We recommend that you try to find a server yourself, though, because NordVPN’s recommendation system isn’t that accurate. NordVPN is unusual in that it offers long-term subscriptions. Though most providers top out at a year’s worth of service, it offers up to three, and with a significant discount. If you’re a fan of the service, you can cash in on your patronage by getting the monthly rate down to less than $3. You get a lot for your money, too. NordVPN is an industry leader when it comes to server locations, rivaled only by the inferior HideMyAss (read our HideMyAss review). Some of NordVPN’s servers are reserved for certain purposes. Its range of specialty servers allows you to get more security by using Tor or hop from one server to another. It has many other features, too, including a good malware blocker and app kill. Though there’s inconsistency when selecting a server, the value and raw power of NordVPN is undeniable. You can learn more in our NordVPN review or try it yourself with a 30-day money-back guarantee. Windscribe is the best free VPN, and though that usually comes with negative connotations, it’s a surprisingly good VPN service. The free plan doesn’t come with streaming-specific features — during our testing, it still accessed Netflix — but the paid service has servers optimized for Netflix. “Windflix,” as it’s called, enables you to bypass Netflix’s VPN block. Windscribe offers Windflix locations in the U.S. and UK, so no matter what content you’re trying to access, you’ll be able to find it. The locations are built for Netflix, but we were able to access other platforms during our testing, as well. Even if you sign up for the free plan, you can get Windflix without upgrading to a full plan. Windscribe is one of the few VPN providers that let you shop a la carte. Instead of purchasing a full subscription, you can add locations to your free plan for $1 per month, enabling you to access Netflix for as cheap as possible. Windscribe’s free plan is something special and we’d like to see similar offerings from other providers. It limits data transfer instead of speed. Each month, you can use 10GB of data for free across three locations. That said, what makes it stand out is the ability to expand that plan without fully upgrading. Extra locations are $1, but that small investment doesn’t just give you access to a few more servers. For each location you purchase, Windscribe adds an additional 10GB of bandwidth to your account. You can even purchase an unlimited bandwidth option for $1. When it’s all said and done, Windscribe allows you to stream as much Netflix as you want for only $2 per month. Free users get most of Windscribe’s features, too, including a suite of privacy tools for your browser and a malicious link checker. Though it’s not as fast as ExpressVPN, Windscribe has a long list of features for a low price. You can learn more in our Windscribe review or sign up for the free plan to try it. VyprVPN consistently takes sixth place when we’re creating our roundups. It’s a solid VPN, but it falls behind other providers when it comes to server locations and speed. That said, it gets into Netflix and comes with a few unusual security features. U.S. Netflix was no problem for VyprVPN. It had trouble accessing Netflix in some European countries, but, overall, its performance was solid. Its speed wasn’t bad, either, but it struggled more than our other selections. It takes a hefty tax on your initial connection. After that, though, the service stays quick. While the basic package only comes with support for up to three devices, VyprVPN works with routers, so you can bypass that limit. It even provides a front-end interface for routers, making it easy to log in and change aspects of the service. By default, VyprVPN uses AES 256-bit with OpenVPN to secure your connection. Though that’s the gold standard for VPN security, you can also take advantage of other protocols. Among them is VyprVPN’s proprietary Chameleon protocol, which works like OpenVPN but enables you to obfuscate your packets as they’re being sent. In plain terms, that means Chameleon lets you bypass censorship in a way that few other protocols can. By scrambling your packets, it bypasses deep packet inspection, where government agencies and network snoopers can dig into the details and find out that you’re using a VPN. Chameleon doesn’t add anything in the way of security — the standard OpenVPN tunnel is enough — but it has great utility for bypassing censorship. Considering VyprVPN’s clear stance on privacy, even those in the most oppressed countries should be able to use the service without issue. You can learn more in our VyprVPN review or try it with a free three-day trial. While a common demand for VPNs, there are a lot of providers that simply can’t access Netflix. Our picks not only do that, but they do so quickly and consistently. In addition to accessing Netflix, our picks are great VPNs in general. If you’re looking for a general purpose VPN, any of the providers above will do the trick. We recommend ExpressVPN, but what VPN are you using for Netflix? Let us know in the comments below and, as always, thanks for reading. Try different servers (ExpressVPN has several in the U.S.) until you find one that works. I’ve been trying to access Japanese content on Netflix, but both ExpressVPN and NordVPN are blocked as of 8/18/18.Tried several different IPs. Just checked and for Express Tokyo 2 works right now. Didn’t try NordVPN, maybe someone else can weigh in?